Your Windows are named and classified following the British and French custom of naming architectural styles for a reigning monarch. Whether they are original, replacement, hung, sprung with stuck-on bars, or simply painted shut, your sash windows were such a good idea they have evolved very little over the four hundred odd years they have been sliding up and down. They are synonymous with a very British style of house, and changes have only occurred either as a result of legislation or the imperative of a prevailing decorative tradition. Until the redevelopment that followed The Great fire of 1665, which destroyed almost all the timber buildings in the city of London, sliding sash windows were only to be found in the renovated estates of the aristocracy such as Ham House Chatsworth and Kensington palace. The idea that sashes could move along channels inside a box had evolved from "Yorkshire" horizontal sliders, and at some point (probably in France) sashes were counterbalanced using pulleys, so that they could be hung vertically. Following the Great fire speculative developers leased land from the Great estates beyond the tightly packed city walls, and built brick houses in large Squares around semi-public gardens. This established the English classical tradition. To help prevent a recurrence of the fire and it's voracious spread, Building acts had been passed, starting in 1667and culminating in the "Black Act " of 1774. This stipulated that houses should be made of brick, that roofs should be slate and not overhang, and that windows should be recessed 4 inches from the front of the building. The very latest piece of legislation to change the way our windows look has been the Building regulations (part L) introduced in 2002 and most recently updated in 2010. The regulations stipulate that any new window needs to have an insulation value of 2.0 and 1.6 in the case of refurbished windows and those that are part of an extension to an existing house. There is no such stipulation for windows in a listed building. Until recently, this has meant that new and replacement timber windows had to be made to accommodate bulky double glazing inherited from the plastics industry which ruins the look of our buildings with their over-sized glazing bars and chunky timber sections. 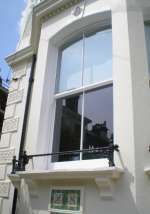 After years in the sash window industry, however, we at Sashglass discovered a remarkable product which would enable people to double glaze their existing Sash or casement windows as well as their new timber windows and comply with building regulations while retaining the look and feel of their home, even on listed buildings. Slimlite have been making their ultra-thin units for the last 6 years and the success and longevity of the product has meant that they can confidently offer a 10 year Guarantee on their Slimlite units. The units comply with BS EN 1279 not just conform to it! They are made in the UK and are the sole manufacturer granted a UK Patent to make Slimlite units.